Stocks look past the worst gun shooting in U.S. history on Monday, Oct. 2, to trade at new records. Stocks returned to highs on Monday, Oct. 2, even as the U.S. came to grips with the worst gun shooting in the nation's history. The Dow Jones Industrial Average was up 0.57%, or 128 points, the S&P 500 added 0.3%, and the Nasdaq increased 0.15%. All benchmark indexes reached intraday records earlier in the session. The death toll following a Las Vegas shooting ticked up to 58 dead and at least 515 injured, officials said in an update. The gunman targeted a music festival by firing from the 32nd floor of the Mandalay Bay Hotel and Casino late Sunday, Oct. 1, according to the Las Vegas Metropolitan Police Department. 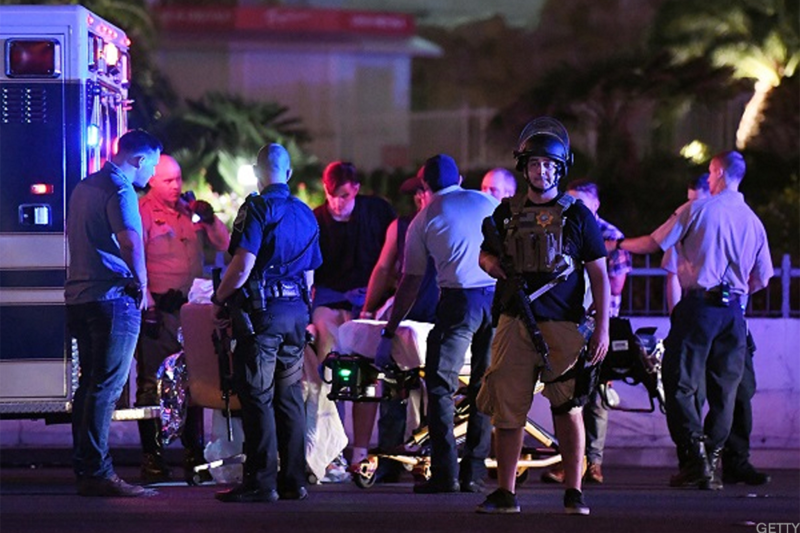 Officials called its the worst mass shooting in U.S. history. The suspect, identified as Stephen Paddock, 64, of Mesquite, Nevada, was found dead in his hotel room after allegedly targeting concertgoers at the Route 91 Harvest Festival on the Las Vegas Strip during a performance by country-and-western artist Jason Aldean just after 10 p.m. local time. Casino stocks fell on Monday morning. MGM Resorts International (MGM - Get Report) , parent of Mandalay Bay Hotel and Casino, fell 5%, and Wynn Resorts Ltd. (WYNN - Get Report) dropped 2%. Gun stocks surged -- American Outdoor Brands Corp. (AOBC - Get Report) and Sturm Ruger & Co. (RGR - Get Report) both rose around 4%. Stocks closed out both September and the third quarter with gains. The S&P 500 rose 1.9%, its sixth straight month of gains. The Dow increased nearly 2% and the Nasdaq roughly 1%. During the third quarter, the S&P 500 has climbed more than 3%, the Dow 4.8%, and the Nasdaq 5.7%. Healthcare was the best-performing sector on Monday. Johnson & Johnson (JNJ - Get Report) , Novartis AG (NVS - Get Report) , UnitedHealth Group Inc. (UNH - Get Report) , Merck & Co. (MRK - Get Report) and AbbVie Inc. (ABBV - Get Report) were all higher. The Health Care Select Sector SPDR ETF (XLV - Get Report) increased 0.8%. Walt Disney Co. (DIS - Get Report) was one of the top performers on the Dow on Monday after the world's largest entertainment company secured a last-minute deal with Altice USA Inc. (ATUS - Get Report) . Subscribers to Altice's Optimum cable TV service avoided a blackout of Disney channels on Sunday, Oct. 1, as the two companies said they were close enough to signing a new programming agreement to extend their contract hours before it was due to expire. Manufacturing conditions improved to 60.8 in September, up from 58.8 in August, according to the ISM index. New orders, production, order backlogs and employment all grew in September. Improvement in the index was a surprise to analysts looking for a slight decrease to 58. A separate reading on the manufacturing sector also showed improvement. The PMI Manufacturing Index increased to 53.1 in September, up from 52.8 in August, according to Markit Economics. The move was higher than an expected increase to 53. Tensions between the U.S. and North Korea ratcheted higher over the weekend as President Donald Trump continued his war of words over Twitter. In a series of tweets on Sunday, Trump wrote that Secretary of State Rex Tillerson was "wasting his time trying to negotiate" with North Korean leader Kim Jong-un. He also said that diplomacy with the rogue nation had failed under the Clinton, Bush and Obama administrations. Investors were also looking ahead to the September jobs report on Friday, Oct. 6, in what will be the first full month in which the effects of hurricanes Harvey, Irma and Maria on the labor market will be laid bare. Weekly jobless claims have already shown the initial impact with the number of new applications for unemployment benefits seeing an uptick in recent weeks. "Work disruptions due to Hurricanes Harvey and Irma are likely to knock down payroll growth substantially in September," Wells Fargo analysts wrote in a note. "It bears the potential to interrupt the 83 consecutive months of employment growth." Wells Fargo expects 55,000 jobs to have been added to the U.S. economy in September. Meanwhile, economists surveyed by FactSet anticipate 75,000 jobs to have been added, a sharp slowdown from the 156,000 jobs added in August. The measure has not fallen below the 100,000 mark since March and has only been below that threshold four times in the past five years. Scenes from the deadly attack in Las Vegas. The unemployment rate is expected to hold at 4.4%. Hourly earnings are forecast to climb by 10 basis points to 2.6% year over year. On a month-by-month basis, earnings are expected to increase to 0.25% from 0.1%. Cal-Maine Foods Inc. (CALM - Get Report) rose 1.5% despite after reporting a steeper quarterly loss than anticipated. The egg producer posted a loss of 33 cents a share, 11 cents deeper than expected. Revenue of $262.8 million fell short of $264.1 million consensus. CEO Dolph Baker said the results reflect "continued solid retail demand and a modest increase in both volumes and prices." Nordstrom Inc. (JWN - Get Report) sank more than 7% after insiders said talks to take the Seattle-based retailer private could be in danger of failing, according to The New York Post. The Nordstrom family announced it was exploring a possible buyout in June and was said to be nearing a deal with private equity firm Leonard Green & Partners last month. Banks have reportedly been reluctant to fund the deal due to expectations for a weak holiday season. Fellow retail chains such as J.C. Penney Co. (JCP - Get Report) , Kohl's Corp. (KSS - Get Report) , Macy's Inc. (M - Get Report) , TJX Companies Inc. (TJX - Get Report) , and Gap Inc. (GPS - Get Report) were all lower on Monday. The S&P Retail SPDR ETF (XRT - Get Report) decreased 0.3%. TJX is a holding in Jim Cramer's Action Alerts PLUS Charitable Trust Portfolio. Want to be alerted before Cramer buys or sells TJX? Learn more now. PepsiCo Inc. (PEP - Get Report) dropped 1% after Jefferies downgraded its rating to hold from buy and cut its price target to $108 from $133. The firm pointed to difficulties in the U.S. market as reason for the downgrade. PepsiCo is a holding in Jim Cramer's Action Alerts PLUS Charitable Trust Portfolio. Want to be alerted before Cramer buys or sells PEP? Learn more now. Updated from 1:21 p.m. ET, Oct. 2. Sign up to get all of TheStreet's best video in one place, your in-box.